Stimulite Silver Seat Cushion, constructed by Supracor, is specifically designed for individuals who are at a lower risk for decubitus ulcers, more commonly known as bed sores or pressure sores. Featuring Stimulite honeycomb technology, a flexible, permeable cellular matrix, the Stimulite Silver Seat Cushion will regulate temperature and moisture. This Ulcer prevention wheelchair seat cushion is different from other seat cushions because it can be used in a wheelchair, on a recliner or even a hard stadium seat. This seat cushion will take any discomfort level from sitting and transform it into an exceptionally comfortable, stable and supportive experience. To provide the ultimate sitting experience, this seat cushion measures in at a mere 1.5-inches thick and weighs only 1 pound. Because the Stimulite Silver Seat Cushion is so light and compact, it is ideal for traveling, as you can easily toss this cushion into an overhead compartment on an airplane, a vehicle's trunk, traveling bag and more. As with the entire line of Supracor, the Stimulite Silver Seat Cushion is machine washable. 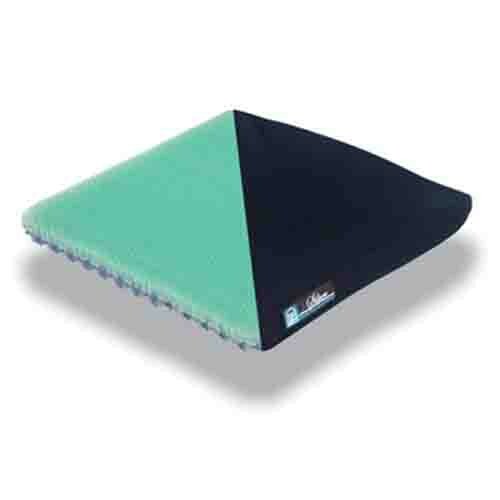 To efficiently mitigate pain and prevent decubitus ulcers, bed sores and pressure sores, order this long-lasting, yet comfortable and supportive all-purpose seat cushion for all of your sitting needs today! Provides comfort, support and stability. Stimulite honeycomb design to regulate moisture and temperature. Product Numbers: SI1616, SI1618, SI1816, SI1818, SI1820, SI2018, SI2020. Sizes (all measurements are in inches): 16 x 16, 16 x 18, 18 x 16, 18 x 18, 18 x 20, 20 x 18, 20 x 20. Application: To mitigate pain and discomfort from pressure sores, decubitus ulcers, and bed sores.